If you are required to appear at the deposition, be sure to work with a Newport Beach personal injury law firm to learn about making a good impression before the judge and the opposing attorney. It is not necessary to be gifted at public speaking to do an excellent job when testifying in court. By listening to the advice of your accident attorneys in Orange County, holding to these five points and trying to avoid a few common mistakes, you won’t have a problem when giving testimony. 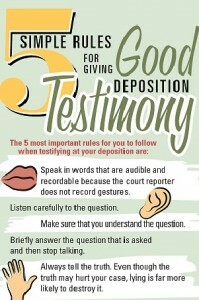 A good testimony will benefit your case immeasurably. At the deposition, you will have to give information about any previous injuries. Describe such injuries, and, if you’re not sure whether you were injured in the past, then provide the relevant information to the best of your knowledge. You should come to the deposition ready to recall important details of your injuries such as the manner of their progression, the nature of the pain you felt and how the injuries limited your activities. To that end, your Newport Beach Personal injury attorney may advise you to create a written list of such details. He will review the list prior to the deposition during which you will not be allowed to use a written list or create one. You should also create a list of all doctors and any other medical professionals who treated you for your injuries. If you list them in chronological order, you will able to provide a time line of treatment in your testimony. If you were injured in an accident, you should consult with a Newport Beach personal injury law firm about obtaining compensation for your injuries. For a free initial consultation with an attorney, please contact the law offices of Russell & Lazarus APC at 1-949-851-0222.